VO=MS VOLENDAM; 3rd/4th Adult Share $529; 3rd/4th Child Share (up to age 18) $449; Gov’t Fees & Taxes: $127 ppdo; $84 3rd/4th; Drivers Insurance: $75 Per Driver; Cancellation Fees Protection: 10% of Total Price; Per Person, Double Occupancy (PPDO) prices are based on Ocean View Stateroom Category FF. View Terms & Conditions. The Complete Land & Sea Vacation. 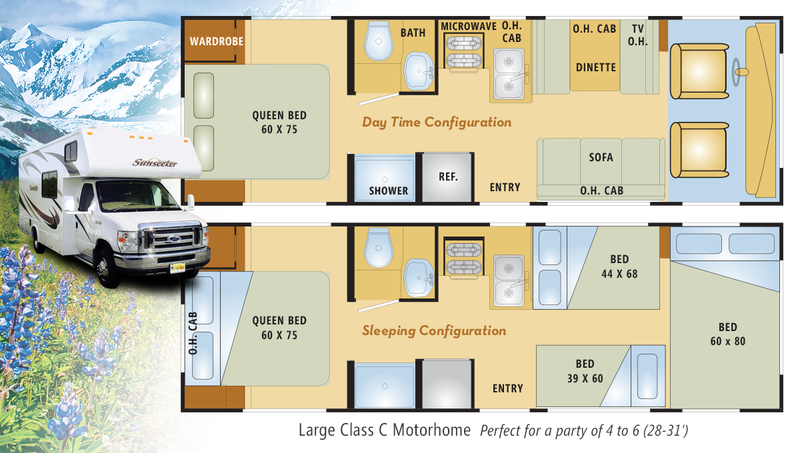 Every vacation includes a cruise and up-close and personal experience in your own motorhome. You have several choices, all including the scenic Inside Passage and Denali National Park. Explore your home on the road. & read about area highlights. DAYS 1-3. Cruising the inside passage. Juneau port of call. Board your cruise ship in Vancouver, B.C. and prepare for an unforgettable adventure. Cruise the beautiful Inside Passage including Tracy Arm and Twin Sawyer Glaciers enroute to Juneau, Alaska’s capital. Here, enjoy exciting optional Juneau shore excursions like the Whale Watching Adventure, Mendenhall Glacier Float Trip, Historic Gold Panning Adventure & Salmon Bake, Glacier View Sea Kayaking, Historic Gold Mining & Panning Adventure, Mendenhall Lake Canoe Adventure, Whale Watching & Salmon Bake, Best of Juneau® and the Gold Creek Salmon Bake. DAY 4. SKAGWAY. 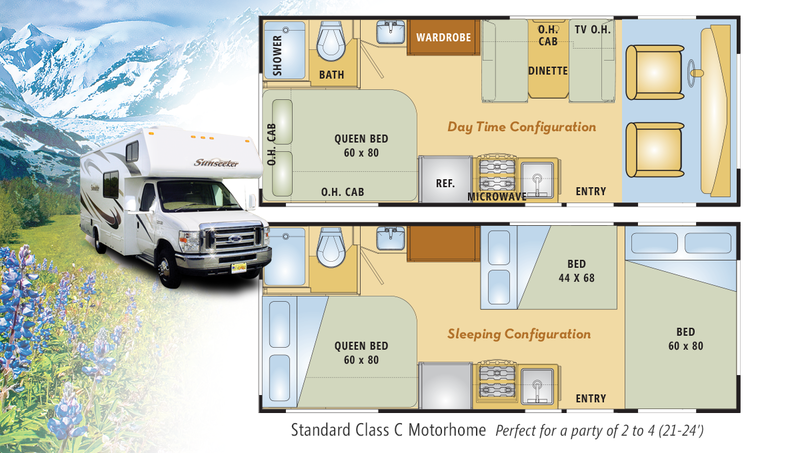 Pick up your motorhome at the Skagway RV Depot and receive a through orientation. You’ll still have plenty of Alaskan daylight left to stroll down Broadway and try out Skagway’s shops and saloons. We’re handy if you have last-minute questions about your motorhome. DAY 5. SKAGWAY-WHITEHORSE. Today you can seek out adventures in Skagway, including the optional Liarsville Gold Rush Trail Camp & Salmon Bake or the Yukon Sightseeing Adventure by Hummer®, or just sleep late before beginning your motorhome tour with a drive up the scenic Klondike Highway to Whitehorse. You’ll have an overview of the arduous White Pass Trail, used by stampeders of the Klondike Gold Rush. In Whitehorse you overnight at your reserved campsite. DAY 9. DENALI NATIONAL PARK. Now for Denali National Park, home of North America’s tallest mountain: 20,320-ft. Denali. Consider an optional tour. Perhaps a flightseeing tour with a local naturalist to help you spot Dall sheep, moose and caribou in the peaks and valleys below. DAY 10. DENALI-ANCHORAGE. Drive south on the Parks Highway, with mountain views to amaze you and friendly small towns along the way, such as Talkeetna— headquarters for Denali climbers. In Anchorage take in some city sights, or a great seafood dinner. Overnight. CUSTOM SELECTION 1A: Deletes Beaver Creek and 2nd night in Anchorage. 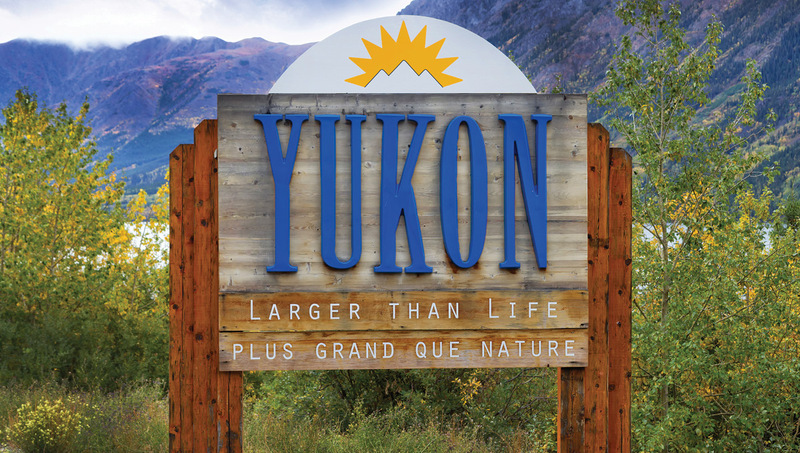 Adds Dawson City and Tok. On day 6 drive Whitehorse to Dawson City and overnight. Day 7 drive Dawson City to Tok. On day 8 overnight Fairbanks, days 9 and 10 overnight Denali and day 11 overnight Anchorage. Add $100 per party for this Custom Selection.